Microsoft today announced the Internet Explorer Developer Channel, a fully-functioning browser designed to give Web developers and early adopters an advance look at what features the company is currently working on. You can download it right now at devchannel.modern.ie. The Developer Channel is available only to Windows 7 SP1 users running Internet Explorer 11 and Windows 8.1 users. Thankfully, like the Chrome Canary channel, it can run alongside and independently of IE11 (possible using a combination of code changes and App-V Client for virtualization). 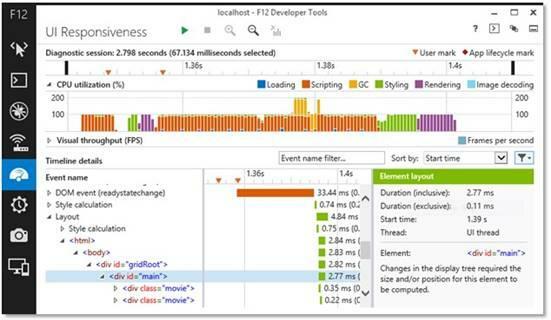 Microsoft notes that since the virtualization creates a small performance hit, it’s not recommended for using to measure a site’s performance. Today’s launch is the first of many Developer Channel releases; the company plans to share early code as it works on new features and standards. At its Build 2014 conference, Microsoft launched status.modern.ie, a site that shows developers what Web technologies are supported in IE and which standards are being considered for future versions. Last month, when it announced what is coming in the next IE release, the company also took that site out of beta. New features supported in the IE Developer Channel are thus now listed on the roadmap portal. Tools aside, the IE Developer Channel also comes with support for the emerging WebDriver standard, which allows Web developers to write tests for automating browsers to test their sites. WebDriver is a programmable remote control for developing complex user scenarios and running them in an automated fashion. If that sounds right up your alley, setup instructions and a sample WebDriver project are on MSDN. The new version also improves WebGL performance and adds support for instancing extension, 16-bit textures, GLSL builtin variables, and triangle fans. Microsoft notes its Khronos WebGL Conformance Test score has improved from 93 percent to 97 percent. Last but certainly not least, the IE Developer Channel lets you use your Xbox controller for Web gaming. This is not to be confused with the recent news of Windows drivers for the Xbox One controller. While these features are certainly great additions, we’re surprised it took Microsoft so long to copy this idea from Google. Chrome got its Dev channel in January 2009 (along with the matching Stable and Beta channels). Mozilla followed up with its own version (dubbed Aurora) in April 2011. While fanboys can attack each other over which company copied what feature from whom, the debate is rather pointless. If your competitor is doing something that benefits the user, there’s only shame in waiting unnecessarily long to do the same.